The white marble Peace Monument was erected in 1877-1878 to commemorate the naval deaths at sea during the Civil War. The 44-foot-high monument stands in the circle to the west of the U.S. Capitol at Pennsylvania Avenue and First Street, N.W. At the top of the Peace Monument, facing west, stand two classically robed female figures. Grief holds her covered face against the shoulder of History and weeps in mourning. History holds a stylus and a tablet that was inscribed "They died that their country might live." Below Grief and History, another life-size classical female figure represents Victory, holding high a laurel wreath and carrying an oak branch, signifying strength. Below her are the infant Mars, the god of war, and the infant Neptune, god of the sea. The shaft of the monument is decorated with wreaths, ribbons and scallop shells. Facing the U.S. Capitol is Peace, a classical figure draped from the waist down and holding an olive sprig. Below her are symbols of peace and industry. A dove, now missing and not documented in any known photographs, once nested upon a sheaf of wheat in a grouping of a cornucopia, turned earth, and a sickle resting across a sword. Opposite, the symbols of science, literature and art (including an angle, a gear, a book, and a pair of dividers) signify the progress of civilization that peace makes possible. At the corners of the monument, four marble globes are visually supported by massive brackets. The fountain below, with a jet on each side, empties into a quatrefoil-shaped basin. Inscribed "In memory of the officers, seamen and marines of the United States Navy who fell in defense of the Union and liberty of their country, 1861-1865," this sculptural group has also been called the Naval Monument. The sculptor of the monument was Franklin Simmons (1839-1913), who was born in Maine, where he became known for his portrait busts. He worked in Rome after 1867, when he received the commission for a statue of Roger Williams for the National Statuary Hall collection. In all, he created four statues and three busts for the United States Capitol. The Peace Monument is an example of his idealized neoclassical sculpture. Peace Monument, first intended for Annapolis, was conceived by Admiral David D. Porter, who had commanded fleets of gunboats and troop transports during the war. Porter first sketched a simple design depicting Grief and History; beginning in 1865, he raised funds from private contributors, and the monument was commissioned from Simmons in 1871. The sculptor carved the Carrara marble in Rome and worked directly with Admiral Porter on many changes in the designs, including the addition of other figures. The architectural part of the monument was made by the Bonanni Brothers of Carrara, Italy, under Simmons's direction. 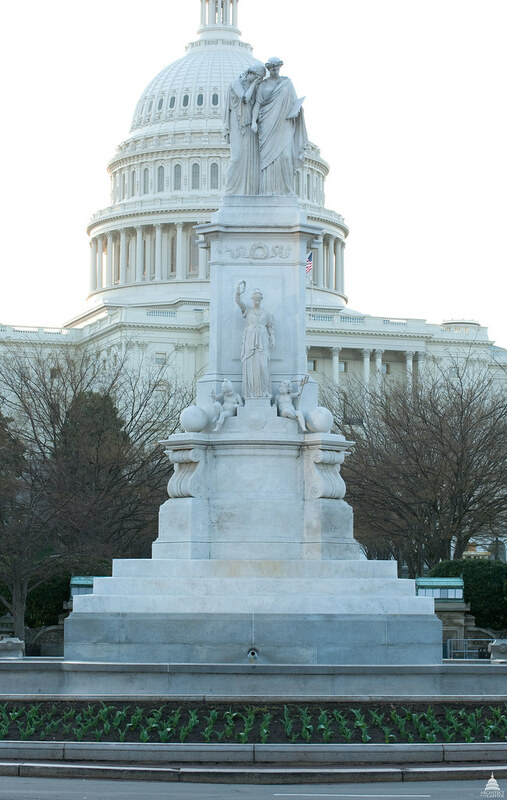 The marble pieces were shipped to Washington in 1876; in 1877 the monument was erected on the base of Maine blue granite (designed by Architect of the Capitol Edward Clark); and the final figure, Peace, was set into place in January 1878. The monument became the responsibility of the Architect of the Capitol in 1973, when the circle on which it stands was made part of the U.S. Capitol grounds. In the almost 100 years since its completion, the condition of the monument had deteriorated to such an extent that restoration became necessary. Carrara marble cannot withstand the outdoor environment, particularly modern acid rain, which dissolves the porous stone and leaves a sugary, crystalline surface. The marble was also disfigured by grime, dark lichen growths and black crusts caused by pollution. Several limbs and objects were broken off through weathering or by protestors climbing the monument. Conservation treatment in the spring of 1991 was preceded by analysis of the marble and the black crusts, and by testing the effectiveness of various consolidants. The monument was then thoroughly cleaned of grime and plant growth with water detergents and chemical agents. The black crusts were laboriously removed with toothbrushes. Fissures in the marble originally created by stresses in the stone and enlarged by the action of acid rain were filled. The major missing sculptural elements were replaced with casts in a lightweight cementitious material tinted to match the stone and attached with stainless steel rods. Finally, a special stone consolidant was repeatedly applied to harden the marble and to make it water repellent. This consolidant will need to be reapplied approximately every 10 years. The conservation treatment markedly brightened the marble, brought out obscured details, and reintegrated the form and meaning of the sculptural groups. Although it was not possible to restore the monument to its original appearance, the surface having been significantly eroded in more than a century outdoors, further deterioration was arrested and the life of the monument has been prolonged. Related work in 1990 included replacing stone curbing, resetting granite, repairing and repointing all of the masonry, laying new paving blocks in the circle, and repairing and waterproofing the fountain basin. In July 1999 conservation work included cleaning the marble with water under gentle pressure, replacing several missing pieces, and applying a "shelter coat" of lime to help extend the life of the sculpted figures, which have been eroded by acid rain. Conservation work was carried out once more in the fall of 2010 from a scaffold. Professional sculpture conservators thoroughly cleaned the marble with gentle washing and toothbrushes to get into the small crevices and to remove grime, moss and other biological growth, and empty wasp nests. They then reapplied a special stone consolidant that has successfully kept the marble details from washing away. The most visible part of the work was the installation of newly cast replacement pieces for parts of limbs that had deteriorated or were broken off when people climbed on the monument during an inauguration event.